Anne Bertolotti’s group in the LMB’s Neurobiology Division have developed the first platform to discover selective inhibitors of phosphatases, a class of enzyme which have largely been considered ‘undruggable’. This has allowed Anne’s group to identify a small molecule, Raphin1, which selectively inhibits a protein phosphatase and is effective in a mouse model of Huntington’s disease – an exciting step in the potential treatment of neurodegenerative diseases. A huge variety of cell and organism functions – from signalling to metabolism to movement – are controlled by the reversible phosphorylation of proteins. 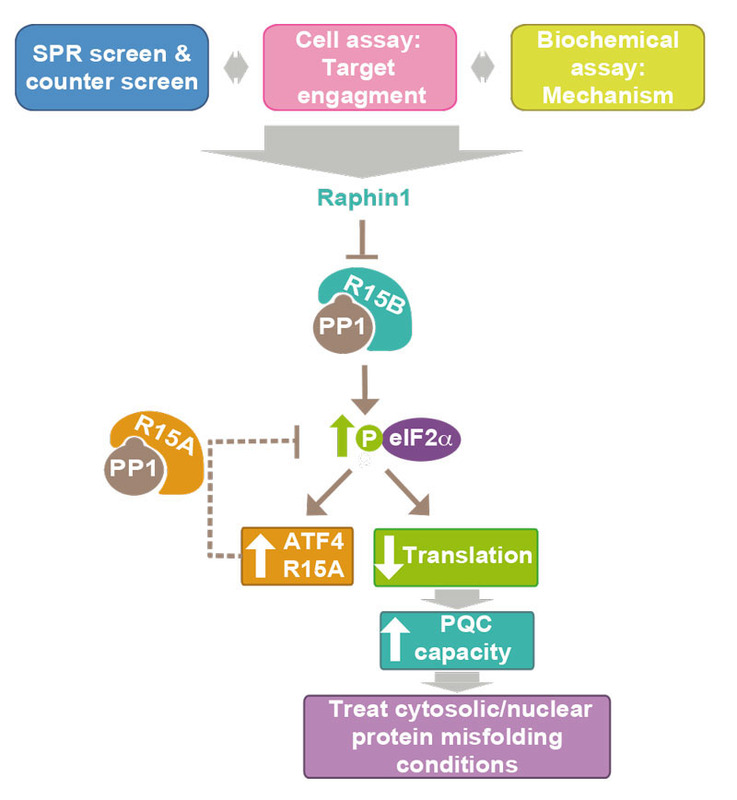 Consequently, targeting phosphorylation holds great potential for developing drugs to treat disease and indeed kinases (the enzymes that phosphorylate proteins) are amongst the most common therapeutic targets. However, phosphatases (the enzymes that dephosphorylate proteins) have remained largely undruggable. Recently, Anne’s group discovered a selective inhibitor which targets the regulatory subunit of a serine/threonine phosphatase. This was exciting as it showed that this phosphatase could indeed be inhibited, however whether other phosphatases could be inhibited in the same way remained unknown. Scientists in Anne’s group have now developed the first method to screen for selective serine/threonine phosphastase inhibitors. They used the method to screen for selective inhibitors of a regulatory subunit of protein phosphatase 1, R15B. This phosphatase is a negative regulator of proteostasis – when it is inhibited, proteins in the cell are kept in better shape. 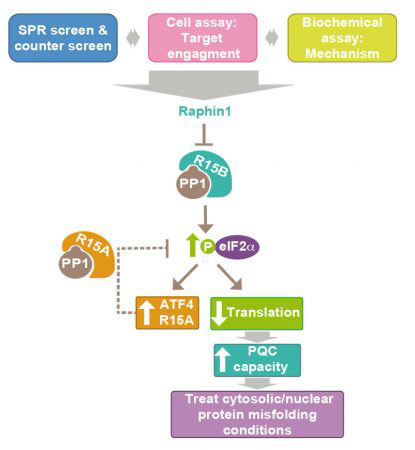 The screen identified the small molecule Raphin1 as an inhibitor of R15B. 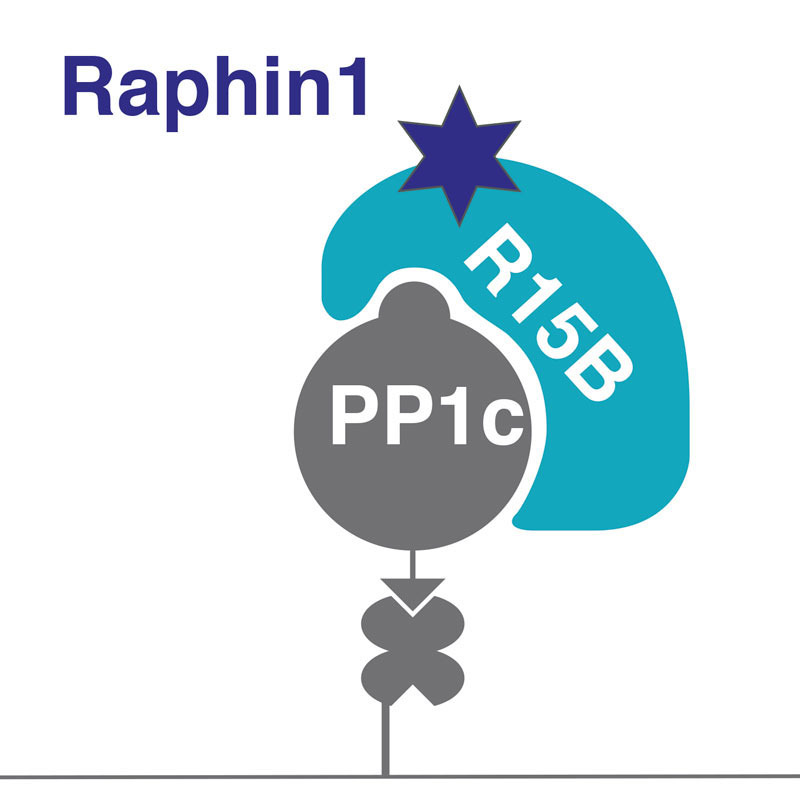 When added to cells, Raphin 1 caused a temporary reduction in protein synthesis. This consequently increased the cells’ quality control capacity by reducing the quantity of protein the cells had to process and therefore allowing them to correct more protein misfolding defects. Accumulation of misfolded proteins is a fundamental cause of a large number of human diseases, including neurodegenerative diseases such as Alzheimer’s, Parkinson’s or Huntington’s. To explore whether Raphin1 could be useful in the treatment of such diseases, Anne’s group gave it to mice which display features of Huntington’s disease. Mice could be given Raphin1 orally, it crossed their blood-brain barrier and was indeed an effective treatment. Overall this new work identifies R15B as a druggable target for Huntington’s disease, and provides the first platform for target-based discovery of inhibitors of serine/threonine phosphatases. Finding a way to selectively inhibit these enzymes is important because there are about 200 different phosphatases, controlling all aspects of cell biology, and this could open up a broad range of possibilities to treat disease. There is currently no treatment for any of the devastating neurodegenerative diseases which represent a huge burden for our aging society. This novel approach may pave the way to a new therapeutic strategy for such diseases. This work was funded by the MRC, the European Research Council, the Human Frontier Science Program, EMBO and the Swiss National Science Foundation. The molecules and technology have been licensed to CamPhos Therapeutics, of which Anne is a co-founder and the Chief Scientific Officer.